Although rifts probably appeared in Pangea almost as soon as it was formed, the Late Triassic probably saw the first real cracks in the world- continent. This was particularly apparent around North America which began to separate from Europe, to the East, and from the old Gondwanan continents of Africa and South America to the South. In eastern North America, the Newark Supergroup reflects repeated cycles of rifting, basin fill (as lakes or seas invaded the rift valleys), followed by volcanic activity and more rifting. In the West, subduction of the sea floor continued under the western coast, with gradual addition of island arcs and microcontinents to the west coast. Much the same process was occurring on the western edge of South America, although there was less accretion of new land. Subduction of oceanic crust under the west coast led to a rather irregular lifting of the broad coastal plain. By the end of the Late Triassic, the Andes had begun to form as the light oceanic crust melted below the margin of the craton and rose up to add to the mass of the continent. By the Late Triassic, a permanent seaway -- what would become the Tethys Seaway -- was already beginning to separate Africa from Europe and North America. Much of southern Europe was still attached to Africa at the beginning of the Late Triassic. However, by its end, a definitive fault line had propagated west from Arabia to Morocco, finally separating the last elements of Europe from Gondwana. At the same time, parts of North Africa were rapidly subsiding, resulting in the formation of a broad shallow sea, probably continuous with that which covered most of Europe. Parts of southern Africa, or the region where South America, Africa and Antarctica met, experienced enormous lava flows beginning in the Late Triassic and extending into the Jurassic. This presumably represent ted the beginning of the stresses which later led to the southern rift between Antarctica and India, on the one hand, and Africa and South America on the other. The Late Triassic is rather poorly known in the remainder of Gondwana. The pattern of subduction which was discussed in connection with North and South America continued around the "back end" of Antarctica and, weakly, onto the West coast of Australia. The Cimmerian islands, the present Turkey, Iran and Tibet, broke completely free of the Australian craton and moved rapidly to the north. Eventually, these were to merge with the Chinese terranes, which had separated from Gondwana previously. Finally, much of Europe and Russia were covered by the encroaching shallow waters of the Tethys. These became the home for the famous Triassic vertebrate fauna of Europe, including the sauropterygians (plesiosaur ancestors) and many key transitional actinopterygian species. At the same time, the broad, dry plains of equatorial Pangea provided a proving ground for a strange new group of lightweight, but large-bodied, archosaurs -- the dinosaurs. World sea levels were consistently low throughout the Triassic, and most of the vast landmass of Pangea was elevated and far from any water. There were no polar ice caps or continental glaciation. Not surprisingly, then, the climate of most of the world was intensely dry and hot. The deposition of large quantities of evaporites and calcretes along the new rift valleys, as well as in western North America testifies to the prevalence of desert conditions in much of the world. However, far southern Gondwana, northern Europe and Greenland were thickly wooded subtropical refugia for animals requiring a cooler, wetter environment. North China, on the other hand, was hot, but damp and tropical swamp and jungle -- a foretaste of a climatic regime that was to become much more prevalent as Pangea dispersed in the later Mesozoic. These predominantly hot and dry conditions may have actually become worse during the course of the Late Triassic as volcanic activity, particularly the South African flows added conspicuously to global carbon dioxide levels. On the other hand, there is also evidence that the aridity of many coastal regions was seasonal. During some wet season, these same areas may have experienced considerable monsoonal rain. Unfortunately, this type of ecosystem often leaves a poor fossil record, since it supports relatively few large animals. ATW030322. On all levels, the Late Triassic was an age of transition. In the seas, the Ceratitidan ammonoids underwent a drastic and progressive decline from a mamximum diversity of 150 genera and subgenera during the Carnian, to 90 in the Norian, and only half a dozen in the Rhaetian [Teichert 1988 p.59]. The last of the straight-shelled nautiloids (belonging to the order Orthocerida/ Pseudorthocerida, depending on one's interpretation) that so typified the Palaeozoic seas also dissapeared after a brief Tethyan resurgence. But a single genus of nautilid, Cenoceras, survived to give rise to all later nautilids [Teichert 1988 p.57] . So did Phyllocerid ammonoids, although the relation between the Triassic forms and the Jurasisc newcomers are unclear [Teichert 1988 p.59]. The Triassic marine reptile fauna is dominated by ichthyosaurs, both the mediumn to large, predominant Shastosaurs and the newer, more dolphin-like Parvipelvia. Not only were they diverse and widespread, but some shastosaurs grew to be the largest reptiles that ever lived; the Norian Shonisaurus sikanniensis was the size, literally, of a balleen whale. On the other hand, other reptilian groups like the Pachypleurosaurs, Nothosaurs and Placodonts are clearly in decline, the former two dissappearing in the Carnian, the latter straggling through (with only one species) to the Rhaetian. The Rhaetian also sees a radical replacement of typically Triassic marine reptiles with Early Jurassic forms. 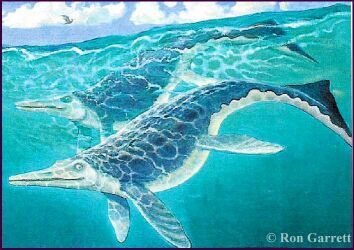 It seems likely that some sort of trophic turnover must have affected the marine food chain, leading to the exitinction of the gigantic shonisaurs and their smaller cousins, and enabling the evolutionary radiation of new types of ichthyosaurs and the first "nessie"-style plesiosaurs. This change is so dramatic that with the exception of a single genus of placodont ("reptilian walrus"), all Rhaetian marine reptiles are of the classic "Liassic" (early Jurassic) type. On land typically Mesozoic-Cenozoic plants such as "modern" Conifers appeared during the end of the Late Triassic (Rhaetian), and the giant and throughout the Triassic common Neocalamites sphenopsids dissapeared. Of course it is the tetrapods that grab the most attention, and we have already briefly mentioned the amazing ichthyosaurs of this time. While on land, the Late Triassic was the beginning of the"'Age of Dinosaurs", and constitutes one of the most important faunal replacements among non-marine tetrapods. A number of important groups appeared suddenly in the (Late?) Carnian (phytosaurs, advanced pseudosuchia, small crocodylomorphs, dinosaurs and mammals), and Norian (pterosaurs), of which the pseudosuchian thecodonts and immediately took over the landscape, and phytosaurs the rivers and lakes. Dinosaurs remain mostest-sized and rare during the Carnian, but had filled many ecological niches by Norian and Rhaetian time, both herbivores and carnivores reaching large size (6 to 9 meters in the case of the herbivorous plateosaurs and melanorosaurs). 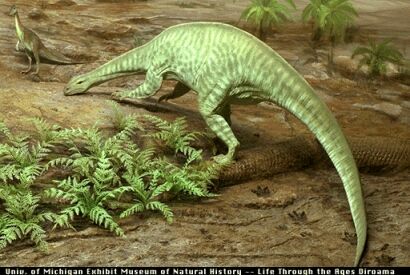 The Norian also saw the decline of the Kannemeyerid dicynodonts, which were replaceed as megaherbivores by prosauropod and early sauropod dinosaurs, although continuing on for a while numbers in the wetter biomes of the equatorial and Gondwanan regions. The end-Rhaetian mass extinction saw the extinction of all the large pseudosuchian/crurotarsan "thecodonts" (even those that only appeared during the Carnian) and all but two or three families of large temnospondyl amphibian, leading to an even greater doiminance by dinosaurs as the Jurassic openeed. However, small protococodilian pseudosuchians (Sphenosuchia) continued through to the Jurassic quite happily, as did most lepidosaurian lizard-like forms and the equally lizard-like Choristodera, the little mammals, and several clades of small advanced cynodonts very close to the mammalian stem. Can sauropodomorph success be explained in terms of what one might call the "Mammal model" (sudden extinction of competitors produces vacant ecological niches), the "Archosaur model" (environmental factors like climate change favour one group over another), the "Insect model" (a completely new adaption enables the type radiates into many ecological niches that were previously unfilled), or the "Teleost model" (the new type is simply a superior adaptive design and takes over from the less efficient rivals)? Current research seems to indicate there was no mass extinction [Hunt et al] which invalidates the "Mammal model". If there really was no dramatic global climate change [Olsen et al] such as was previously thought, that leaves out the "Archosaur model". And the fact that prosauropods were around for at least several million years during the Carnian (being found in the possibly early Carnian of Madagascar, although Lucas & Heckert 2002 argue for an early late Carnian date) without going anywhere seems likewise to cast doubt on the "Insect" and "Teleost" hypotheses. Whatever the reason, the change in terrestrial megaherbivore biotas is so marked that Anderson and Cruikshank coin the term "Plateosaur/Melanorosaur empire" to distinguish the Norian and following Rhaetian land faunas from the preceeding Olenekian through to Carnian "Kannemeyeriid/Diademodontid empire" (Kannemeyeriid/Gomphodontid may be more correct, as Diademodon is mostly Olenekian). Zawiskie 1986 likewise refers to the equivalent "Rhynchosaur-Traversodontid Community" (which he describes as Gondwanan, it has since been found that elements of this community also occured in (at least Western) Laurasia) being replaced by the "Plateosaur Community"
All the sauropodomorphs were herbivorous dinosaurs, with long necks and small heads. With the dissapearance of the Rhynchosaurs and Trilophosaurids (at the end of the Carnian) and the Therapsid (mammal-like reptile) Dicynodonts (during the Norian) and the decline of the Traversodonts, they became the dominant terrestrial herbivores. Whereas all of the earlier forms had strong jaws and teeth or horny beaks, the sauropodomorphs had tiny heads and weak jaws and teeth, and used gastric stones, like modern-day birds, to grind up food in the stomach. Here we see the replacement of mammal-like masticatory apparatus (strong jaws and teeth, which grind up the food in the mouth) with the bird-like emphasis on gastric stones. Through the ascendancy of the early sauropodomorphs and their descendents the gigantic sauropoda, this bird-like "chewing" was to characterise the dominant herbivores for 80 to 100 million years (from the late Triassic to earliest Cretaceous), while the mammal-like chewing ornithopod dinosaurs, with their elaborate batteries of teeth were to remain as minor players, before suddenly diversifying in the middle and late Cretaceous, perhaps in response, as with the Triassic prosauropod success, to a change in climate and/or vegetation. During this same period the genuine mammals also waited in the sidelines, as small nocturnal rodent-like creatures, until the extinction of the dinosaurs gave them space to undertake their evolutionary radiation after the end of the Cretaceous. But that is another story.